What Does The "on Reports" Table Do In The Plane Advanced Properties? It would seem it can be used to trigger things when a command is completed, but it does not appear to work. I don't think this for commands (events), that's what OnEvents is for. No clue what this does though. 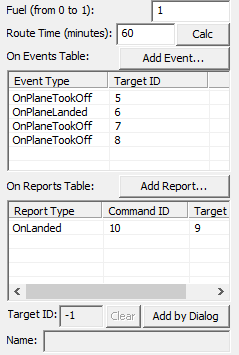 Some of the commands in the report table are not available in the events table. That's the case of OnSpawned, for example. I haven't managed to get it working, either. As a guess, I'd think it might be a filter for mission feedback - possibly an unfinished feature? My thought is that it's something to do with debugging the actual game...logs/reporting FM info and all that.